We had a flight booked from Mumbai to Kathmandu for an overnight stay there, which should have got us to our hotel about 8pm. Sadly the flight was delayed a few hours, so by the time we had landed and got our Nepal visa which you collect at the airport, then got a pre-booked taxi to the airport, we didn’t get to our hotel till around 1am. And with us booked on the Tourist Bus to Pokhara at 7am, it meant we didn’t get a lot of sleep and had to miss breakfast. In the morning after a short walk round to the main road, we were met with a huge line of coaches from various companies, and after a little while we found ours and got onboard. 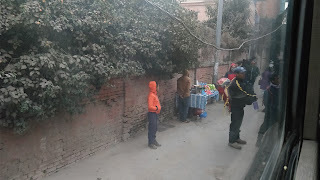 Just at the side of the road, various locals had set up little stalls selling coffee, snacks and egg rolls (but not like we are used to), they were basically a wrapped omelette with veg etc in it, but very tasty and welcome before the long 7-8-hour journey ahead. The journey out of Kathmandu took a while as all these buses leave at the same time, and with over 20+ of them along with the morning traffic and horrendously bumpy roads, it wasn’t far out of the city until we had our first rest stop. 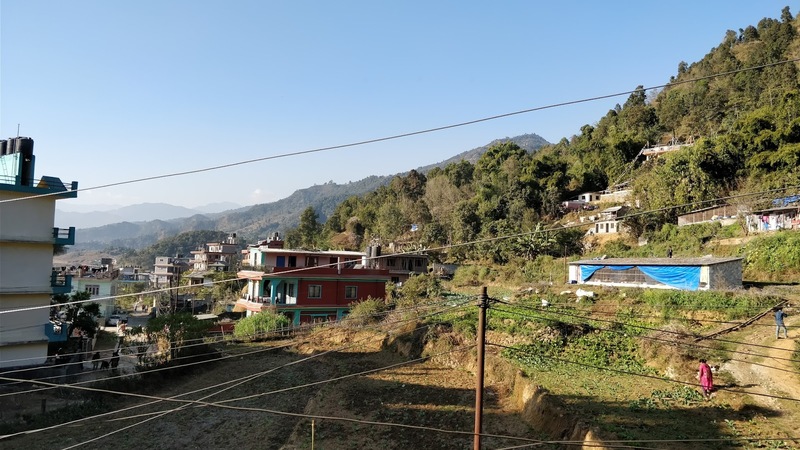 Once on to the main Prithvi Highway that links Kathmandu to Pokhara, the views were stunning and we could see the Himalayas as well as the rolling hills all along the long winding road. 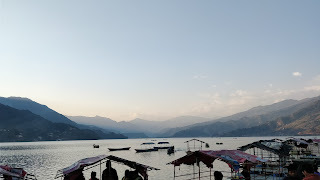 We had a few stops along the way for toilet/coffee etc and eventually got to Pokhara around 3pm, then negotiated a taxi to take us to our accommodation. I’d found an Airbnb apartment for our 11 nights here, and with a full living room area, kitchen and double bedroom for around £12 a night, it was ideal for our needs. It was in a quieter part of town, but only a 10 min walk from the busy lakeside area, nestled at the bottom of the hill and the locals could be seen living their daily life from our balcony which made interesting viewing at times. It was nice to get properly unpacked instead of living out a rucksack, and once we had got sorted, we headed down to the lakeside to get our bearings. 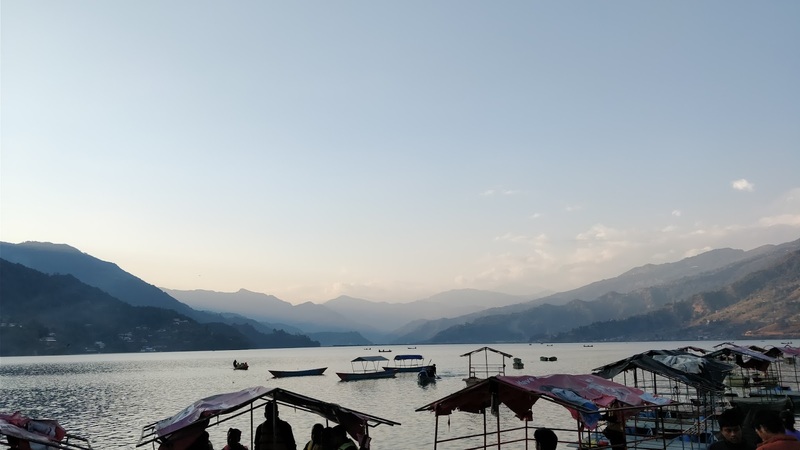 This area was beautiful, with the hills in the foreground, Himalayas in the distance and the stunning lake along with loads of paragliders in the sky. Our first meal here obviously included the local delicacy Momo’s along with what Sadie describes as the best Chocolate Brownie she has ever had! The next day we decided since we had a kitchen, we should make some of our own meals to save some money, and set off on the 45 min walk to the supermarket. Now while we didn’t expect a Tesco style store, over here shopping/cooking is very different and after a long while, we got some supplies focusing mainly on breakfast items and some snacks. Then the rest of the day was spent walking around finishing up with a lovely Vietnamese meal at night. Our evenings in Pokhara all consisted of having amazing food from various places mostly recommended in Tripadvisor, and once we had eaten we were usually back at the accommodation by 9pm as the door would be locked at 10pm, and while the owner’s wife said to knock on her window to get in, we decided we would just be home early.. as it was also very cold in the evenings! In fact, we instantly regretted sending some clothes home when in Mumbai as soon as we got here, though we have managed to wrap up enough to stay moderately warm. There is no heating over here in homes though, so an early night under the duvet was a blessing in disguise! As it was lovely and sunny during the day, we decided to take a walk along to one of the paragliding landing spots which was around 30 mins walk along the lakeside, which was a beautiful walk. One of our things to do here was to also go to the World Peace Pagoda which is on the other side of the lake, then up the hill to the top. So, we headed along to get a boat to take us over, and whilst in the queue this foreign man approached us and asked where we were going. After a bit of confused conversation, he paid for the 3 of us to go over on the boat with a driver to the Pagoda. Amrak was from Saudi Arabia, who had travelled here on his own and was obviously just looking for some company. Once on the other side of the lake, the driver said it would take about 45 mins to get to the top, so he would wait 2 hours for us to take us back over again. Nearly an hour and a half later and around 1100 metres up, we just got to the top as the Pagoda was about to close, where we got amazing views of the surrounding countryside along with this magnificent structure. A few photos later, we headed back down where thankfully the driver had waited for us and darkness was setting in as we sailed back over to the lakeside. Amrak had also asked Sadie to send the photos of us together to one of his wife’s, so we duly obliged. The next day we spend going around the shops, I was looking for a new t-shirt and Sadie wanted a pashmina, and after a bit of haggling she ended up with 2 plus some baggy trousers and I got a lightweight cotton shirt which will be ideal for when we get to warmer climates, all which only cost a few quid each. 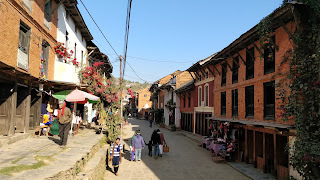 We had planned an overnight trip to Bandipur, a World Heritage site about 2 hours away and which took 3 local buses to get there. 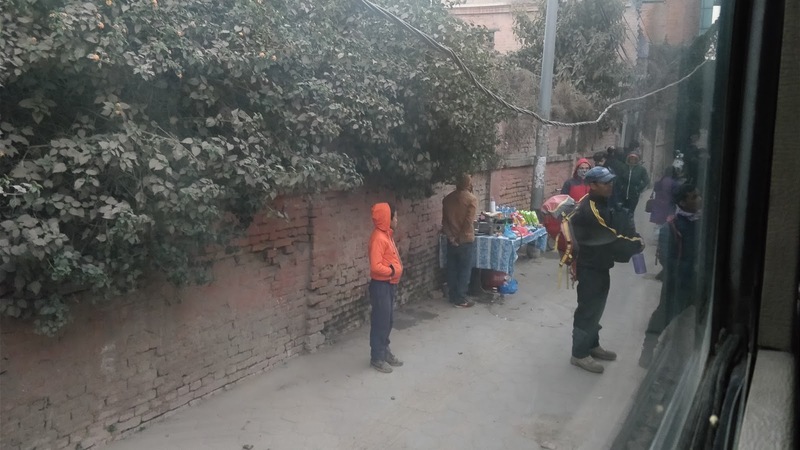 The local buses here are cheap, yet we still had to haggle our fare as they do try and scam tourists for as much as they can, the main part of the journey was quoted at 600 rupees each, but we had researched it and paid the 200 each that it was meant to cost. Once there, the hotel we had booked was nothing like the description so we turned that one down and got another one slightly better along the road. The main thing we wanted was heating as Bandipur is up a hill, but alas all we got was an electric fire and with only one working bar, it was more a glow in the room rather that any heat. But the views made up for this, along with a lovely 18th century village with the main road traffic free and a few temples scattered about. 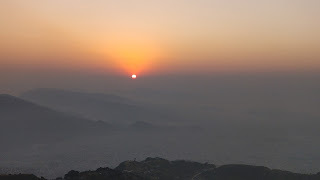 Also, the view for sunset/sunrise was awesome, and we also went to a local restaurant for food where we didn’t even get a choice of what to eat, with the owners bringing out a Nepali Set (Thali) which was delicious, if slightly overpriced. The next morning, we decided to walk down the hill to the Siddha Gufa Cave, said to be the largest in Nepal. The walk down the zig-zig path and uneven steps was around 2 hours, and yes, my calves felt it the next couple of days too! 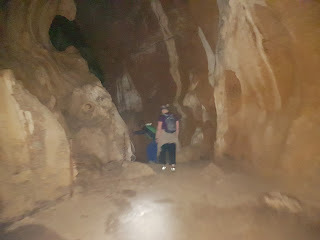 Arriving at the caves and paying our 200 rupees entry with guide, off we went into the darkness with our headtorches on. Now in the UK, our H&S laws would probably have ruled this kind of adventure out, as we scrambled over rocks, wet slippery slopes and down ladders bolted loosely to the rocks. It certainly was an eye opener and harder work than we thought, but enjoyed it none the less and after about 40 minutes, we scrambled back out into daylight. Continuing down the hill we got to the main road, where we caught another local bus back to Pokhara, but not before we witnessed a local man haul 4 goats out the boot of one bus and into another one which was very bizarre! On the Wednesday, we arranged another overnight trip away, this time up to a viewpoint near Pokhara called Sarangkot, which was also a great place to view sunset/sunrise and where all the paragliding companies take off from. We got a taxi from our hotel to the summit, around a 40-minute journey up yet another bumpy winding road, and luckily it was a 4x4 or else he wouldn’t have made it to our hotel, and clearly didn’t want to as he tried to drop us off 2km downhill from it. We stayed at the Superview Lodge, which was a lovely room yet also lacked all the facilities it had mentioned on Booking.com, but the room was lovely and it did also have amazing views from our balcony. It was also one of the nearest to the viewing point at the summit, and a short but steep 10-minute walk got us there to catch the sunset. After having our dinner at the hotel, we retired to bed and set our alarms for sunrise, where we had to be up at the summit just before 7am. It was well worth the early rise, and on getting the already crowded viewing area, we seen what was probably the best sunrise I have seen ever. 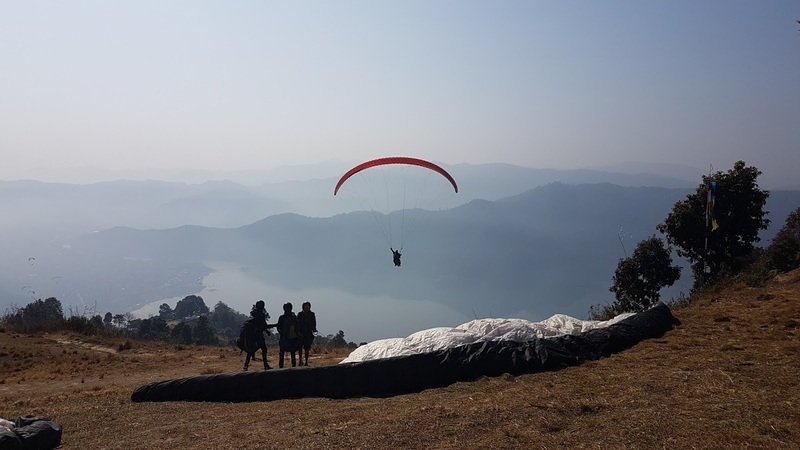 Another reason for coming up to Sarangkot was as today was my birthday, and I had decided it would be a good idea to paraglide back down to Pokhara. Yes, 1600m up a hill and for some reason wanted to run off a cliff towards the ground! Krisha, the owner of the accommodation we were staying in was also a paragliding pilot, so we had arranged through his company Nirvana Fly to meet him at the take-off spot. Once we found the right one, we sat and watched a few people take off and the nerves kicked in for both of us. Yes, Sadie had decided since I was doing it she would also take part! Our pilots arrived and we got kitted up, then Sadie was first to go as I stood and watched her, it didn’t actually look as bad as I initially thought, and started to look forward to it. 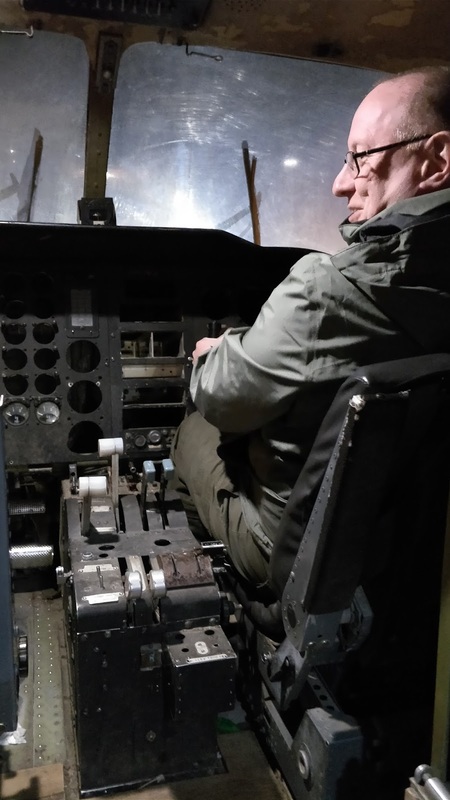 A few minutes later it was my turn, and off we went into the sky, the initial feeling as you take off is something I have never experienced before, but once you are soaring into the thermals and getting higher and higher, it makes it all worthwhile. 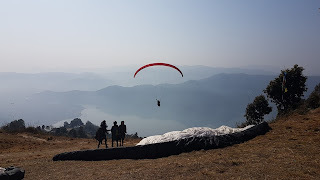 We glided about for around 20 minutes and the views of the Himalayas, Lake Fewa, Pokhara and the surrounding hills was immense, certainly a birthday to remember. We then started our descent, and after a small bit of aerial acrobatics, we landed safely to the waiting Sadie and we both were glad it was over but will never forget. 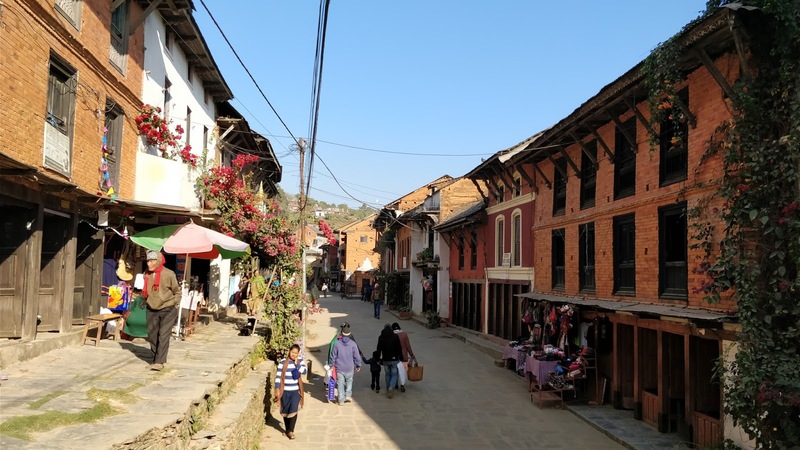 As par for the course on this adventure, I became a little ill again with an upset stomach, so the rest of my birthday was sadly spent in bed, and most of the next day was just a lazy day booking the next part of our trip in Kathmandu and then out for more Momo’s at night. We went for a stroll along the Lakeside on Saturday afternoon, stopping for a quick drink at a bar called Planet Purple. I started off on the soft drinks, but that didn’t last long as we got chatting to a lovely English couple called Will & Fran from Worcester. 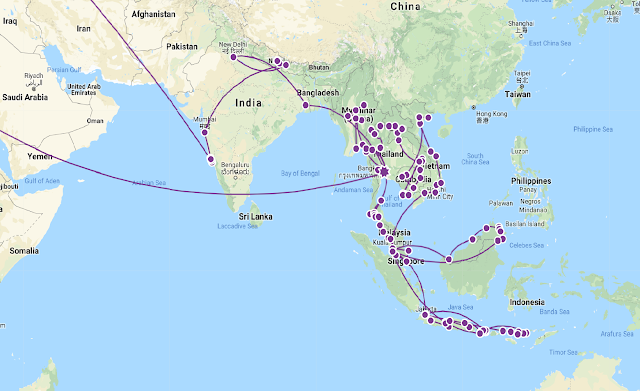 They had just started in Nepal on a 4-5 month trip going to multiple countries including Singapore, Taiwan, Cambodia plus others. We chatted a lot about both our upcoming adventures as it was their first time doing this too, so we had a lot in common, and it certainly passed a lovely sunny afternoon away. We swapped contact details etc as they were also going to do a blog of their travels. 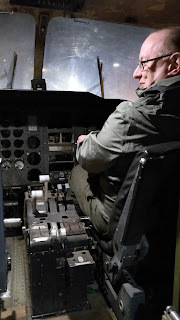 Later that night we met up again for pizza and some beers, and ended up in an old aircraft which was sat on a roof of a nightclub under refurbishment. 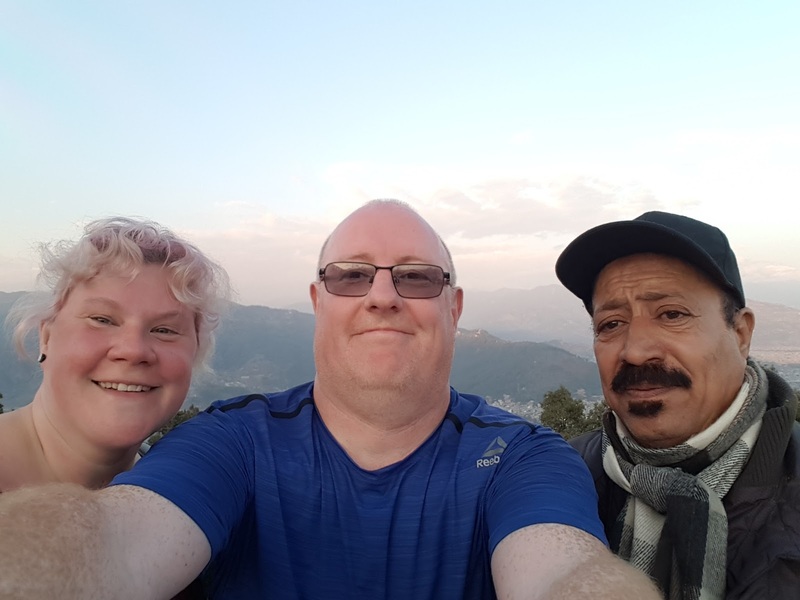 It was certainly a bizarre venue for a drink, along with the story from the waiter who told us the plane had been shipped from Kathmandu on top of a bus after its last flight it had been involved in an accident with tourists on board! So that’s been our 11 days in the Pokhara area. It’s a gorgeous place, with lovely friendly people where strangers come up in the street and say Namaste, amazing food in every place we ate, locals just getting on with life, rebuilding and improving where needed after the earthquake in 2015. I’d come back here, though the cold temperatures in the evening would mean that it would be a slightly warmer time of year. Off on the long bus journey back to Kathmandu for a week next, from what Will & Fran told us, we are in for a busy and interesting time!